As anyone who’s set foot in a fancy coffee bar in the past five years will know, there are now more ways to take your morning brew than we ever thought possible (call us old-fashioned, but we personally lost count after the macchiato and the babyccino). Still, we think variety is something to be celebrated, as you’ll surely find in our list of the best coffee makers. You’ll notice that we haven’t restricted ourselves to just one type, and with very good reason. If you already know exactly how you like your coffee, and exactly how to replicate that at home, the great. If you don’t know what the best style of coffee maker is to suit your lifestyle and make your perfect cup, then read on. If you make large rounds, such as for big family breakfasts or dinner guests, a filter coffee machine will be a much better bet, as they typically come with large jugs and warming plates, while pod machines make just one cup at a time. Coffee pod machines are perfect if you’re strapped for time, and especially if you like a straightforward espresso or long black coffee — while some come with milk frothers for making lattes and cappuccinos, most are no-frills, and just make a great tasting cup of coffee quickly and simply from an impressive range of capsules. If you’re a bit of a mad scientist when it comes to coffee, are very particular about your brew, or just like to experiment, an espresso machine with all the trimmings will be more your speed, but can take a bit more practice to perfect, so they’re better for experienced enthusiasts or very brave beginners. When you clock the number of features on the Ninja Coffee Bar, you’ll understand how it got its slightly grandiose name. It’s far from your bog-standard coffee machine, making milky drinks and iced coffees as well as straightforward hot filter coffee, so it’s a great investment for families with kids or non-caffeinated members. It looks a bit scary, but its helpful instructions and clear backlit buttons make it simple to use. The only downside is that it doesn’t heat the milk as it froths, so if you’re intending to drink a lotta lattes, go for the DeLonghi Latissima Touch, below. It’s steep, yes, but for the real coffee fanatic, this espresso machine is worth every penny of its £500 price tag. From the brilliant brain of Heston Blumenthal, this full-featured machine brings you an integral grinder, automatic dosing with a single touch, high pressure steam wands for cafe-quality milk, and a separate hot water wand for long black coffees. Plus, the pre-infusion function soaks the coffee which (we’re not sure on the science, but trust us) is meant to create a balanced taste. If there’s a coffee-obsessed couple you need to buy a wedding gift for, look no further — you have to really love them though. 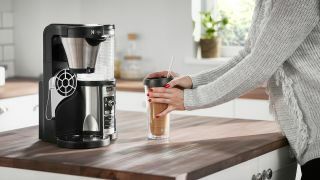 The pour-over technology of this Morphy Richards coffee maker, which mimics a showerhead, is the secret to its full-flavoured coffee — if you’re a black coffee drinker after a strong cup that you can really taste, this is the one. It’s simple to use and has high-end features like a programmable timer, which means you can wake up to a fresh brew every morning. Great functionality for a great price. If in doubt, go for this one. With its intelligent integrated milk frother which heats and whips in one, this De’Longhi Nespresso model is our pick of coffee machines for lattes and cappuccinos. With six preset buttons — ristretto, cappuccino, latte, espresso, long, and hot milk — you can have a perfectly tailored cup in seconds, eliminating all of the guesswork. For quality milky coffees at the touch of a button, this is unbeatable. Tired of shelling out for overpriced, underpowered train station coffee? Then this is your lucky day. The Minipresso is a godsend for commuters with no time for a proper coffee before they leave in the morning, or a Thermos alternative on country walks with no cafe in sight. It’s a little bit fiddly to fill, and it won’t come out as hot as from a machine, but for good coffee on the go, it’s still a winner. Some baristas will tell you that coffee-making is a fine art; some of them, a science. This bonkers drip coffee maker from Norwegian brand Wilfa goes with the latter philosophy, offering the experienced coffee-maker extremely precise control over temperature and water levels to make their perfect personalised cup. It makes incredible-tasting coffee quickly, but best of all (for us, anyway) you can see the brewing process in action through the glass tubes and carafe. Great fun, even if you take coffee very seriously indeed. If you’re a lover of all hot drinks equally, and get the hankering for a tea or hot chocolate as often as a coffee, this capsule machine is a great investment. There are over 35 drink varieties to choose from, and once you’ve made your mind up, that’s it. This machine heats instantly and starts your drink the moment it’s switched on, so no waiting to indulge that craving, whatever it may be. There’s no frother, but this versatile machine is more than worth the occasional trip to the microwave. Once you have mastered how to make the perfect coffee at home, check out our guide to the best coffee thermos flasks and take your coffee with you when you are on the go.